I am not a big doll collector. The dolls in the collection consist of about 10 Liddle Kiddles, some misc. items, a Chatty Cathy, and one of my wife's favorite toys from her childhood, Baby Catch-a-Ball. I would not have known about this doll for some time, had my wife not had this as a child. She remembered it not working too well. Her memory is pretty good! 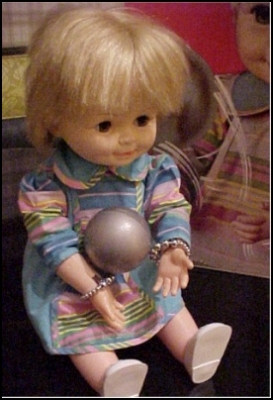 The idea of this doll was to catch a ball that you threw her, and have her throw it back to you. And it does work...once in a while. Truth be known, I can imagine the quite a few little girls got frustrated throwing the ball to the doll, and having to make it hit JUST right. The engineering however, is quite interesting, and when it does work, it is fun to watch. How it worked: The two balls that she came with have a metallic coating. Each of her bracelets are part of an open circuit to her arm cocking and releasing mechanism, which is actuated by a battery operated motor. The circuit is closed when the ball connects with both bracelets simutaneously. When this happens, the motor starts to turn, her arms lower, and the ball (hopefully) rolls into her cupped hands. Then, after a moment, her arms pop up, throwing the ball to you!